Learn More About Lisa Drakeford Here! I'll be honest, when I looked at the summary for this book, it didn't seem like it fit my taste of books. I thought that the summary was a little bit "weird" and that this book would take me places I didn't necessarily want to go. I wasn't sure that THE BABY was a good fit for me, and I strayed away from this book, until it appeared on a fellow book blogger's blog. Amber over at The Mile Long Book Shelf had raved about this book in several of her videos and blog posts. From what I have read of Amber's reviews and from the videos that I have seen, Amber and I tend to have a very similar taste in books that read. Thus, when she said that she absolutely loved this book, I put it on my To-Be-Read List, hoping that eventually, I would get around to reading it. I definitely trust Amber's opinions in books and I was excited to get this book in my hands. Little did I know that THE BABY was exclusively available in the UK at this point in time -- which was more than a year ago. I would have to wait (and hope) that this book would eventually come into the United States with printing and publishing rights so that I could get my hands on it. Luckily enough, that day came around this month, when I saw THE BABY listed on Miss Print's ARC Adoption Agency. After refreshing my memory, I had to jump on this book again, and I eagerly requested this one to review. I had to tell you the backstory to how I received this book, and also how long it has been on my radar, because it does affect my reading experience. As a reader who had anticipated this book for over a year, this is definitely a book that is well worth the wait. The last thing Nicola expected was to be a teenage mother, let alone the fact that she gave birth in her best friend Olivia's bathroom. Her unexpected daughter shakes the world around her, creating rifts and tears in friendships that she used to find solid, changing the dynamic of her familial relationships, and most importantly, changing the very foundation of Nicola's character. With all of the drama surrounding the birth of her daughter, she can't take on the task by herself, and she needs some help. However, her friends are carrying their own burdens. Her best friend Olivia is trying to sort out a very damaging relationship with her boyfriend Jonty. Nicola's friend Ben is questioning who he is at the very core, and Olivia's sister Alice just wants to groom the horses in her imaginary barn. Her friends try to help her the best that they can, but that can be extremely hard to do when Nicola isn't telling them the entire truth. THE BABY takes the reader on a journey spanning several months after the birth of Nicola's daughter Eliza. 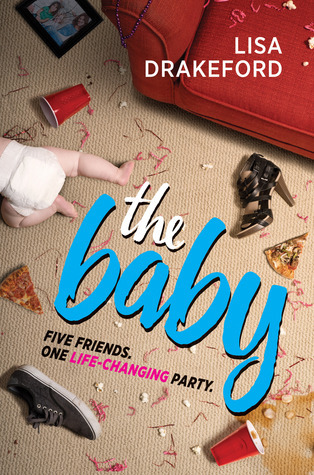 Told through multiple points of view with a very diverse cast of characters, THE BABY offers insight on way more than just Nicola's pregnancy and child. THE BABY pulled me in because it mainly is about teenage pregnancy, something I haven't read a lot about. I definitely agree with Vicky from A Backpack Full of Adventures when she says "Teenage pregnancy – and especially teenage parenthood – is a hugely important issue which, I think, doesn’t get the attention it should in YA literature." Teenage pregnancy is very seldom mentioned in today's society, and even when it is mentioned, it is only mentioned as a consequence and not as an issue in and of itself. Those who have children while in their teenage years can be alienated by their friends, peers, and even their family members. They can be ostracized from their communities and treated as less than human. There was a study done for a class project, in which a teen named Gabby Rodriguez faked a pregnancy and recorded how she was treated (called the Pregnancy Project) and the results were absolutely astonishing. Teenage pregnancy can have very negative consequences, but the problem is that no one ever talks about it, except as a consequence itself. THE BABY brings a breath of fresh air to the young adult genre by approaching a topic like teenage pregnancy in a way that has never been done before. Drakeford, instead of shoving the dialogue about teenage pregnancy to the side, makes it an integral piece of the story. Talking about issues like teenage pregnancy can help to decrease the rates of it's occurrence, and I really appreciate Drakeford's honesty and full-frontal focus on the topic. Drakeford really lets her reader's know that they can find a safe space within the pages of THE BABY, and she is able to craft a discussion about teenage pregnancy (and several other social issues) with care and understanding. Aside from the subject matter of the book, I really loved how the book was laid out. The book is told through multiple perspectives, with each one of the characters it highlights sorting through their own personal lives and trying to break free of their struggles. The narration opens with Olivia and moves through four more characters, each varying in age, gender, occupation, and relation. I love the diversity of the characters within this book, and I believe that reading the point of view from each character really helped me to appreciate that. I was able to get so much more out of the story because of the differences between the characters and I walked away with a deeper appreciation for the story as a whole. The multiple points of view does a very good job in conveying who the characters are, their thoughts, and communicates the meaning of the story as a whole. This book is a little on the shorter side, and while that's not one of it's faults, I wish there was more to it. Toward the end of the book, the reader gets hints and nudges about what might happen in the future, but they don't get to see it. There is a giant twist dropped near the ending, but the reader doesn't really get to see the follow-through. I can't say too much more without revealing it, but I personally really wanted to see how that played out. Introducing conflict at the end of the book can be a great play or a very bad one, and for me personally, I just wasn't feeling it because of how it was brought up. Lastly, I have to mention this, because I absolutely fell in love with Alice -- the younger sister of Olivia. Alice is constantly called "strange" or "weird" throughout the book, and reading things through her perspective made it clear to me that she doesn't process the world and it's happenings like the other characters do. I loved seeing this new perspective and I really feel that I relate to her. Alice doesn't quite understand social situations, but she is very bright and knowledgeable. Her faults are not her only pieces of character, and I truly appreciate seeing this. THE BABY discusses a variety of important issues -- the discussion is not limited to teenage pregnancy itself. THE BABY delves into sensitive topics, like bullying, domestic violence/abuse, and the absence of a parent. The diversity of not only characters but social issues faced in this book is something that is not usually seen in the publishing world and makes it a pleasure to read. Drakeford teaches important, valuable lessons through the lines of the THE BABY, and she delivers on a wild ride that will have you hooked from the very first page. FTC Disclaimer: I received an ARC of this book to review, and this in no way affects my review of the book. All reviews are honest and my own. I received this ARC as part of Miss Print’s ARC Adoption Program.